FOUR new dengue fever cases were confirmed last week – including one who had not been to Lion Rock Park (獅子山公園) – bringing the total number of cases to 23, the highest in 16 years. One of the latest cases involved a 52-yearold man who lives in Cheung Chau (長洲) and works in Lai Chi Kok (荔枝角). He has been staying at home after being diagnosed, said Wong Ka-hing (黃加慶), Controller of the Centre for Health Protection (衞生防護中心) of the Department of Health (衞生署). Unlike most of the cases, Wong said the man did not visit Lion Rock Park, and he remembered being bitten by a mosquito on Cheung Chau. He was wrongly believed to have contracted a serotype that was different to that caught by another person who lives on the island. But further lab tests later found that both had the same strain. 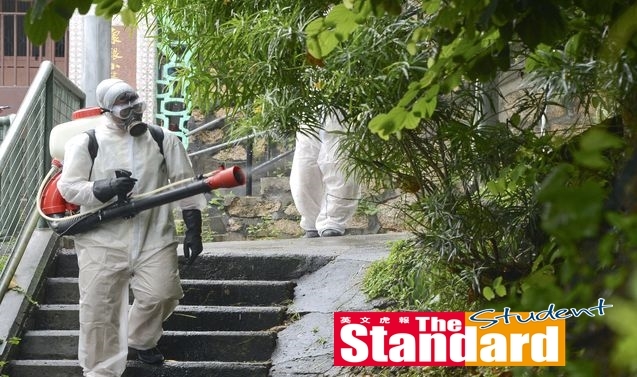 Lee Ming-wai (李明偉), Pest Control Officer-in-Charge of the Food and Environmental Hygiene Department (食物環境衞生署), said a team has visited the area near the patient’s home to kill mosquitoes. Health workers also eradicated mosquitoes on Sha Tin Pass (沙田拗道交界) and Chuk Yuen Road (竹園道). Acting Secretary for Food and Health Chui Tak-yi (徐德義) said the number of ovitraps across the city has been increased to 3,000. Chui said they are expecting more cases of dengue, the symptoms of which include high fever, headaches, muscle pain, fatigue, nausea and skin rash. With a majority of the local cases centred around Lion Rock Park, the government decided on 17 August to close it down for 30 days. Chui said closing the park will help prevent the disease from spreading. “Among the cases, 13 were related to the park. We have confidence that closing it immediately will alert people,” he said. Among four cases recorded on 18 August, two worked at the park, while the other two went hiking there. The four live in Wong Tai Sin (黃大仙) and Tsing Yi (青衣). Despite the closure, some people still went hiking or jogged in the vicinity of the park. A tourist from Australia (澳洲) said she and her friends are confident they would not be infected since they applied insect repellent. Meanwhile, a concern group protested at the Central Government Offices (政府總部) yesterday, calling for tougher measures to combat the spread of dengue. The Centre for Health Protection previously warned that the territory risks an extensive outbreak and officials have stepped up antimosquito measures across Hong Kong. Dengue fever is usually imported from foreign countries, with cases displaying symptoms on return. The centre also reported 61 imported case this year, from Thailand (泰國), the Philippines (菲律賓), and Cambodia (柬埔寨).